Inspired by the best-selling "Reinventing Government", governments at all levels have decentralized programs and services and introduced market-based competition into operations. The goal of decentralization and privatization is to enhance civic participation and harness the market efficiencies that competition can offer. Decentralization and competition have certainly led to efficiencies and innovation. 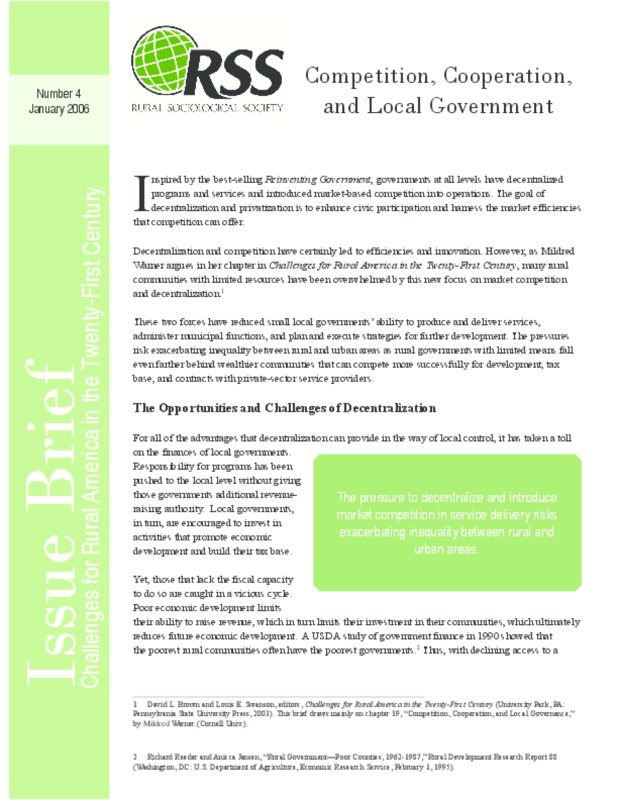 However, as Mildred Warner argues in her chapter in "Challenges for Rural America in the Twenty-First Century", many rural communities with limited resources have been overwhelmed by this new focus on market competition and decentralization. These two forces have reduced small local governments' ability to produce and deliver services, administer municipal functions, and plan and execute strategies for further development. The pressures risk exacerbating inequality between rural and urban areas as rural governments with limited means fall even farther behind wealthier communities that can compete more successfully for development, tax base, and contracts with private-sector service providers.